After a long absence, here’s a sauce review for you all! The value shopper: They are on a budget for their family or buying a large amount. The repeat buyer: People that know what they like – Kraft, Sweet Baby Ray’s, Bullseye, etc. The “try something new” buyer: Every now and then a shopper comes down the aisle who is looking for something different. Since you probably aren’t the cheapest and you are a well-established brand, this is the shopper you are looking to attract. So I evaluated this sauce based on its ability to stand out on the shelf. Birky Family Farms Country Gourmet sounds like a quaint, friendly business name and the sauce is simply named after it. 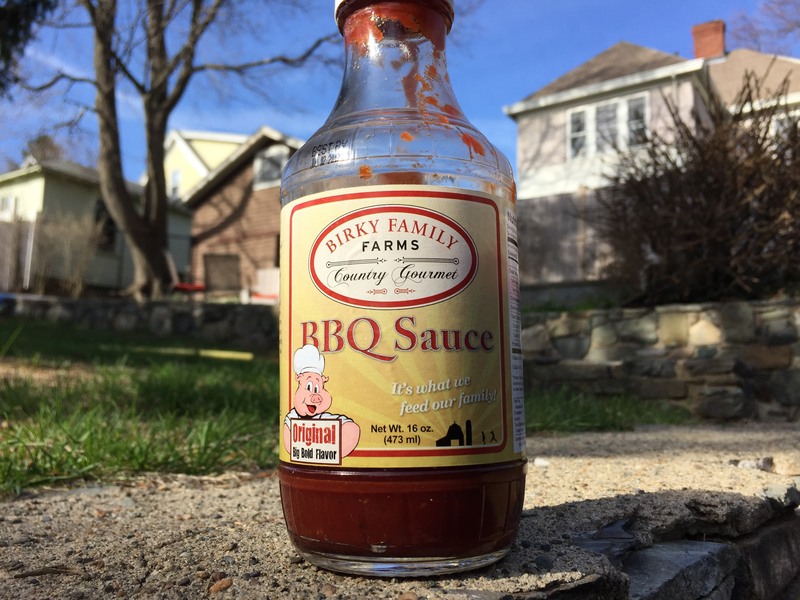 The Original BBQ Sauce itself lacks it’s own identity, but if most people are buying it from your store of gift shop, then it seems like a sensible decision. In other places, where they haven’t heard of Birky Family Farms, it might make sense to have a different name. The quality is high quality and professional – clearly not made at home on a printer. The colors and fonts seem to work together OK, but there is a bit too much going on with the logo and the big BBQ Sauce letters and the “its what we feed our family” in white (on a light background, it’s hard to see unless you have good eyes). Label Concept: Like above, there is a lot going on here: the oval-shaped logo, the pig holding the Original Big Bold Flavor sign, the floating text, and the farm barn and silo, with little kids jumping for joy. I’d say pick one of these main concepts and just go for it, instead of trying to put them all in there. When we flip the label, what starts out as a great family story turns really religious really fast. I have nothing against this approach, and while I love a little backstory, the label forgets to tell us about the sauce contained within. 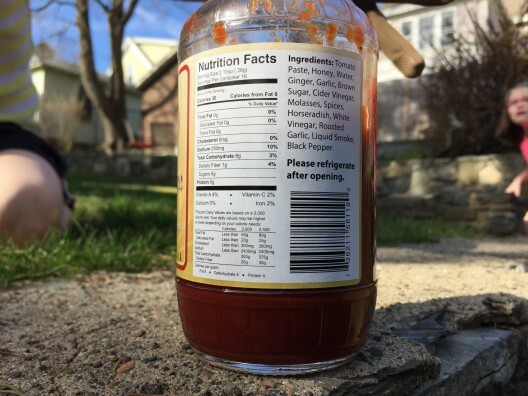 Usually this is a great place to highlight what is special about your sauce – just a thought. The sauce looks great. It has a dark rusty red color with visible spices flailing around the bottle. The consistency of this sauce is thick. Quite thick. If you flip it upside-down completely, it takes at least a second before the sauce changes sides. If you dip in a fork and then hold the fork straight out in front of you, it is likely nothing will fall from the fork for at least a minute or so. Ingredients: Hard to tell, but from hear it looks like they used great ingredients versus cheaper short-cuts like HFCS, MSG, artificial colors, and artificial flavors. It looks to be “all natural” – why not call that out in some way on the front? Uncooked: Uncooked I really enjoyed the flavor. It hits you up front with a sweet blast and then settles in with a complex assortment of spices and flavors hitting your tastebuds from all angles. At first I thought the dominant flavor was horseradish. Nah.. Then I thought it was garlic… No. Maybe ginger. No… You know, there really is no dominant flavor. They mix together nicely without anything overpowering one another. Very balanced and enjoyable. Cooked: I found it equally enjoyable and the sauce maintained its flavor – maybe losing a little sweetness but overall not much difference. The sauce itself is very good and the bottle is OK, and together I’d give that a 4. Enjoyed your review Brian! Sounds like a good sauce to check out! I happen to be a home chef so I took on the challenge. 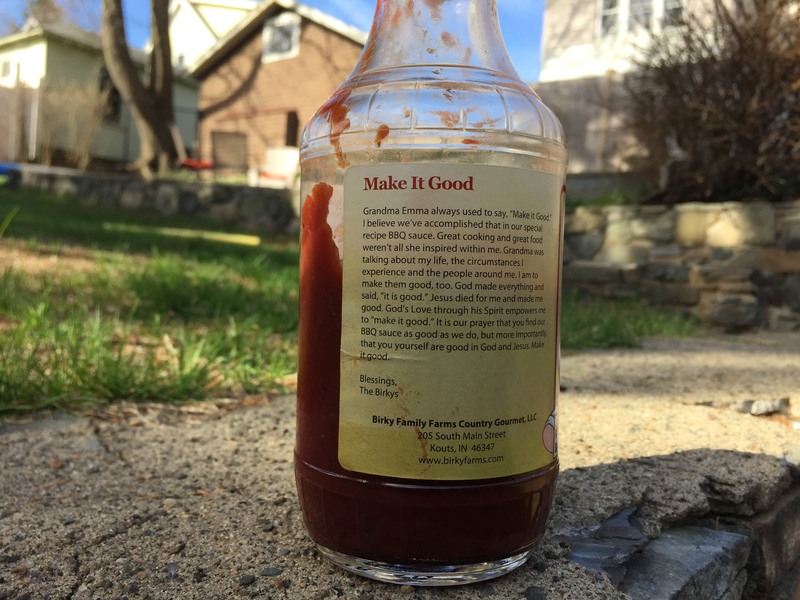 I wondered what people liked in BBQ sauces, so I researched it. Less sugar and more flavor seemed to be the desire. After we made the first batch, we double-blind taste tested it, along with four top-rated commercial sauces. Taking into consideration how tastes change depending on region, we tested in Baltimore, Chicago, Portland and New Orleans, where we had friends. It came in first place at every tasting. I designed the sauce to be mixed with meat drippings, which my research showed was the proper way to use a “mop sauce.” So, mix about 25% drippings from the ribs or pork shoulder, then mop it on to finish. The fat and sugars make the grill really flare up to you can achieve a nice bark, if you like that. I got a random texted this morning from my son. He was inquiring about the sauce. I texted back and said that I hadn’t talked to Birky in years, so I wasn’t sure how it was going. I Googled it and found your review. I agree with everything you said, especially the labeling, which I designed as well. However, that was a long time ago and it’s been altered since. I see it’s available in Whole Foods, which is where it certainly belongs. I painstakingly made sure it was made with real food. When we switched to a larger manufacturer, I was initially there to oversee the transition from a home kitchen to a commercial processor. I remember the head cook trying to sell me on powdered roasted garlic. Nope. This was fun to find online!